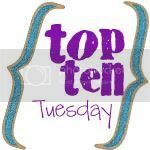 I'm participating in Top Ten Tuesday today and sharing my Top Ten Thanksgiving Tidbits! 1. Thanksgiving is one of my favorite holidays because it's all about good food and fellowship. Sometimes during Christmas we can get so wrapped up in the presents and all the different events of the season that we forget what it's all about. Thanksgiving is about thankfulness and thinking about all the good things we have! 2. I am very thankful this year, especially for the little things. It's been a rough year for us but we are doing well and pressing on. We have a lot to be thankful for - our family, love, a home to live in, good health, food, warmth, extended family, technology, our faith, clothing, happiness - I could go on all day, but I'll stop there. 3. Some of my favorite Thanksgiving memories have been created with my family. One of my favorite things to do back in the day was sleep in a little bit and then watch the Macy's parade while my Mom and Dad cooked food for our family lunch across the street at my aunt's house - Mom always gave me the fruit juices from her fruit salad she was making to drink. (Sounds gross I guess but I used to really like it...) One year when one of my aunts and her family were in New Mexico (they were in the military and stationed there) we all signed and wrote messages on the big paper tablecloth and sent it to them. 4. Our holidays usually involve a lot of running around to our different family member's houses. When I was younger, we used to have lunch at my aunts (who lived conveniently across the street) and then had dinner at my Gramma's. This year we're eating lunch with my hubby's family and then going to my Gramma's for dinner. 5. I've made pumpkin pie for Thanksgiving for the last couple years. I've gotten pretty good at it and it's something I always look forward to. (In addition to all the other good food!) I also really enjoy making Turtle Pumpkin Pie. 6. Hubby and I have gone Black Friday shopping every year that we've been together, except perhaps one. We're not the crazy, buying tons of stuff, knocking people over kind of shoppers - there's usually just a few select things we'd like to get. Plus we enjoy watching the craziness! 7. I've enjoyed getting a refresher course on the first Thanksgiving this year through teaching Zeke. If you haven't read it since school (like me) take a second to look it up! I also love decorating for the holidays and it's been fun to make turkey and Thanksgiving crafts. 9. I'm looking forward to watching the parade and The Charlie Brown Thanksgiving special with my kiddos. Zeke loves pointing out the character balloons in the parade he likes, like Spiderman. Wonderful list! I think Thanksgiving is one of my favorite holidays too. The food, the family time. I don't see myself ever attempting Black Friday shopping, but if I did, it would be about the people watching too. must be nuts there for black friday i know ppl who are already heading down there, just so they don't have to drive over the border on the actual friday.